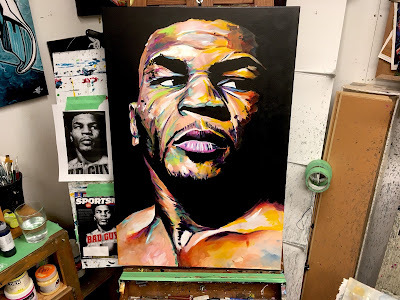 Three visitors in a row to the studio over the Christmas rush glanced behind my main easel and asked about the large poster of Mike Tyson that was hanging on the wall. The original was a small watercolour portrait that I did back in 2012; I had it blown up to poster size for a client and decided to get an extra copy for myself. I felt these three visitors were trying to tell me something as the poster tucked in the back hadn't been mentioned in months. My recent days have been filled with doing tribute portraits of wonderful souls who were alive but short weeks ago. I am always humbled to be asked to take on these time sensitive projects as I know that art can play a role in offering comfort to the grieving. However, they require serious attention and focus as they need to be right. 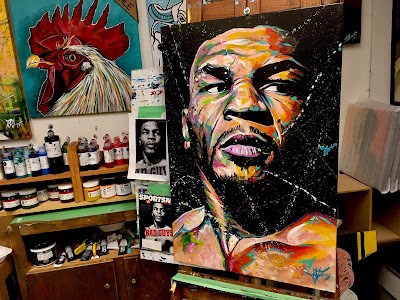 As I finished up another memorial painting yesterday morning, the thought of revisiting Mike Tyson popped into my head and wouldn't let go. I wanted something that I could do large and fast, something that would demand colour, loose strokes and energy. I did a time lapse video of the first round of this project. Using bright yellow, orange, and red, I started bringing shape to the facial features and body. By mixing purple, orange, red, yellow ochre and white, I began playing with various shades of skin tone. Black came in during the dying seconds of the first round. Round two involved added layers and colours to the canvas. A second coat of black went down and more of the details were added. The third and final round was all about colour balance and energy. Teal and blue came into portrait, as did some green and magenta. A third coat of black went down before the canvas went onto the floor for its splatter bath. This portrait of Iron Mike Tyson is all done and ready for display. As it was a "me" project - one where I was driven purely by a creative calling - it means that this unique original painting is available for purchase. 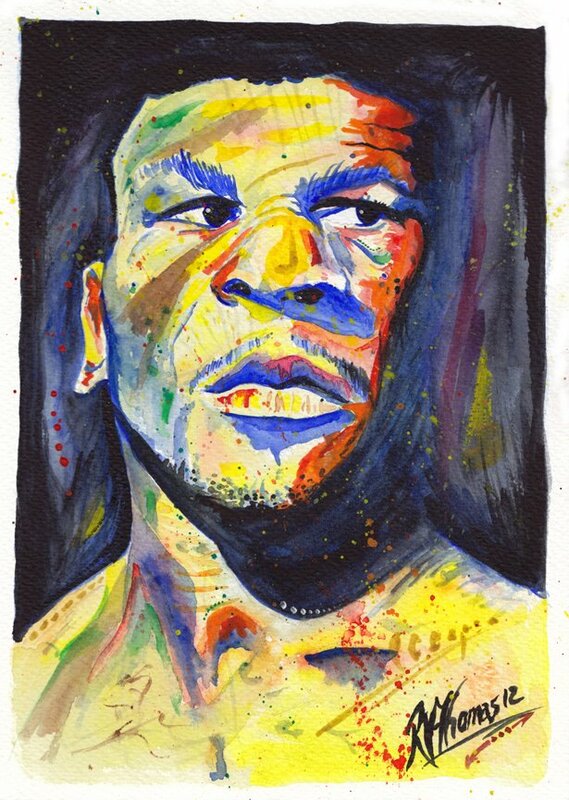 If you're interested, contact me through the Russell Thomas Art Facebook Page. Or, if Facebook is not your thing, send me an email at russell.thomas@birdsongconnections.com.